In the previous post we explained why we chose the distributed control path approach (local controller) for Dragonflow. Lately, we have been getting a lot of questions about DHCP service, and how it could be made simpler with an SDN architecture. 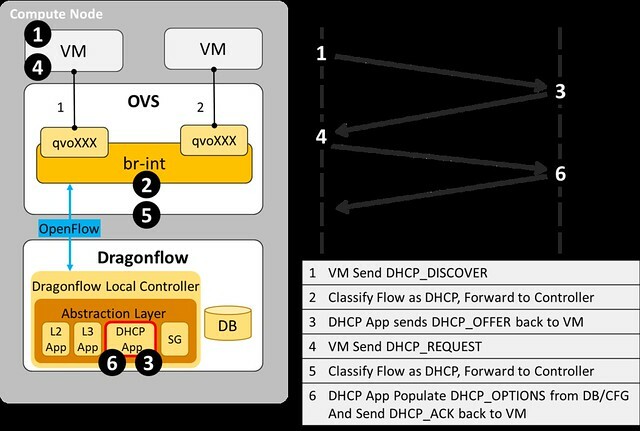 This post will therefore focus on the Dragonflow DHCP application (recently released). We believe it is a good example for Distributed SDN architecture, and to how policy management and new advanced network services that run directly at the Compute Node simplify and improve the OpenStack cloud stability and manageability. Just as a quick overview, the current reference implementation for DHCP in OpenStack Neutron is a centralized agents that manages multiple instances of the DNSMASQ Linux application, at least one per subnet configured with DHCP. Each DNSMASQ instance runs in a dedicated Linux namespace, and you have one per a tenant's subnet (e.g. 5 tenants, each with 3 subnets = 15 DNSMASQ instances running in 15 different namespaces on the Network Node). The concept here is to use "black boxes" that each implement some specialized functionality as the the backbone of the IaaS. And in this manner, the DHCP implementation is similar to how Neutron L3 Agent and the Virtual Router namespaces are implemented. Management - You need to configure, manage and maintain multiple instances of DNSMASQ. HA is achieved by running an additional DNSMASQ instance per subnet on a different Node which adds another layer of complexity. Scalability - As a centralized solution that depends on the Nodes that run the DHCP Agents (aka Network Node), it has serious limitations in scale. As the number of tenants/subnets grow, you add more and more running instances of DNSMASQ, all on the same Nodes. If you want to split the DNSMASQs to more Nodes, you end-up with significantly worse management complexity. Performance - Using both a dedicated Namespace and a dedicated DNSMASQ process instance per subnet is relatively resource heavy. The resource overheads for each tenant subnet in the system should be much smaller. Extra network traffic, The DHCP broadcast messages are sent to all the Nodes hosting VMs on that Virtual L2 domain. 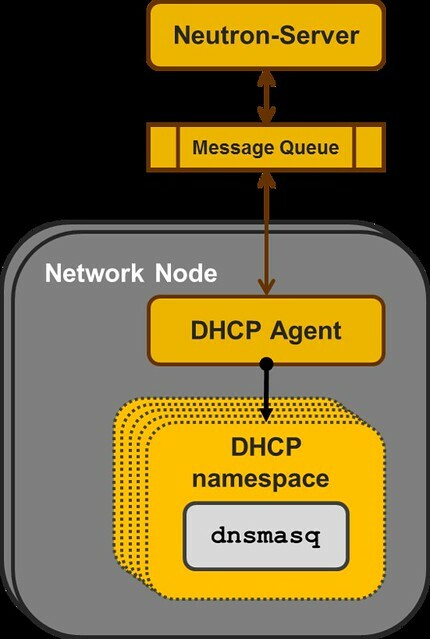 Having said that, the reference implementation DHCP Agent is stable mature and used in production while the concept we discuss in the next paragraph is in a very early stage in the development cycle. When we set up to develop the DHCP application for the Dragonflow Local Controller, we realized we had to first populate all the DHCP control data to all the relevant local controllers. In order to do that, we added the DHCP control data to our distributed database. Next, we added a specialized DHCP service pipeline to Dragonflow's OpenFlow pipeline. In the Controller, we forward the PACKET_IN with the DHCP message to the DHCP SDN Application. In the DHCP Application, we handle DHCP_DISCOVER requests and generate a response with all the DHCP_OPTIONS that we send directly to the source port. The diagram below illustrate the DHCP message flow from the VM to the local controller. And there are surely many more benefits to this approach, feel free to post them as comments. I want it! How do I get it? The source code of this newly developed service in available here, and you could try it today (just follow the Dragonflow installation guide). We are currently working on improving the stability of the L2, L3 and DHCP services of the Dragonflow local controller for OpenStack Liberty release. The Dragonflow Community is growing and we would love to have more people joining to contribute to its success.